80% of people search their health symptoms on the internet and try to self-diagnose (PEW study done in 2012). A lot of people do not realize this, but many of the images on the internet have been labeled incorrectly, so even if you find an image that looks similar to your skin condition, it can have been labeled wrong. We searched for Actinic Keratosis using Google and we clicked the image tab to find relevant images. We then clicked on one of the images. A larger image pops up with a respective link to the webiste and in the right corner there are similar/ related images. Clicked on the image and is says Actinic Keratosis. To the right there is a display of similar/ related findings. We then clicked to the related website, Quality Dermatology – you then come to information related to Actinic Keratosis and the image is embedded in the informational text. The image is a Seborrheic Keratosis, a senile wart, which was confirmed by a board certified dermatologist. Results: Internet lesion that was labeled as Actinic Keratosis. The Skin Image Search™ thinks it is a Seborrheic Keratosis. A board certified dermatologist confirms the image to be a Seborrheic Keratosis (senile wart). What is Skin Image Search™ Can it be trusted? Skin Image Search™ algorithm has been trained on hundreds of thousands of smartphone images from First Derm app users. Over 250 different skin diseases have been submitted over the years. The majority of the queries have been on about 40 skin diseases, which is 80% of First Derm users. The images have been used to train a deep convoluted neural network (CNN). Using skin images to train a CNN has been studied before, specifically on pigmented lesions such as moles and melanomas, where the results have been similar to that of dermatologists. Basically a CNN is given images and data on a much grander scale in a shorter time frame than what a dermatologist comes across in their entire life. So of course with the correct data and correct training, a CNN will be better than a human on identifying skin diseases, but it will take some with time to get there. 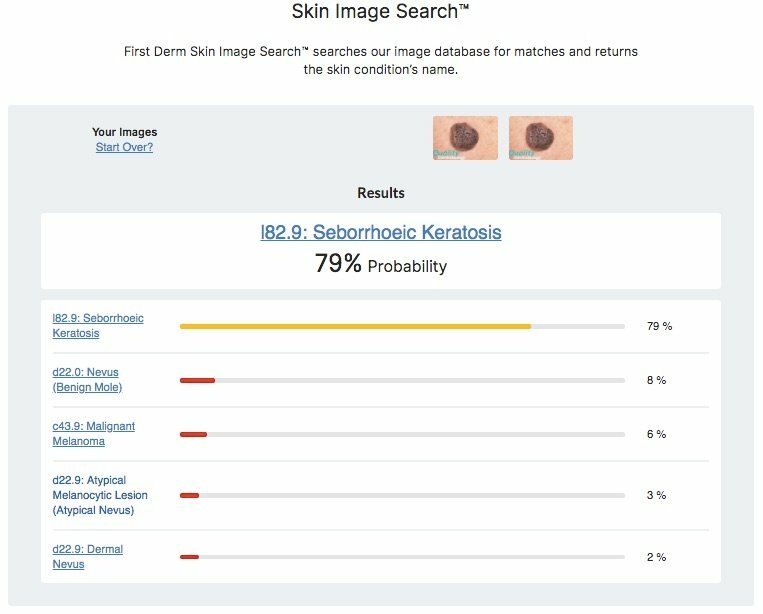 Skin Image Search™ current algorithm has been trained on 33 different skin diseases, it is 40% correct on one skin disease class and 80% correct on the top five skin disease classes (differential skin diseases).